by Custom Biologicals, is a biological wastewater effluent treatment designed for use in municipal wastewater treatment and municipal lift station treatment. F-TREAT will enhance the biological degradation of the organic chemicals found in municipal and wastewater treatment plants and their lift stations. 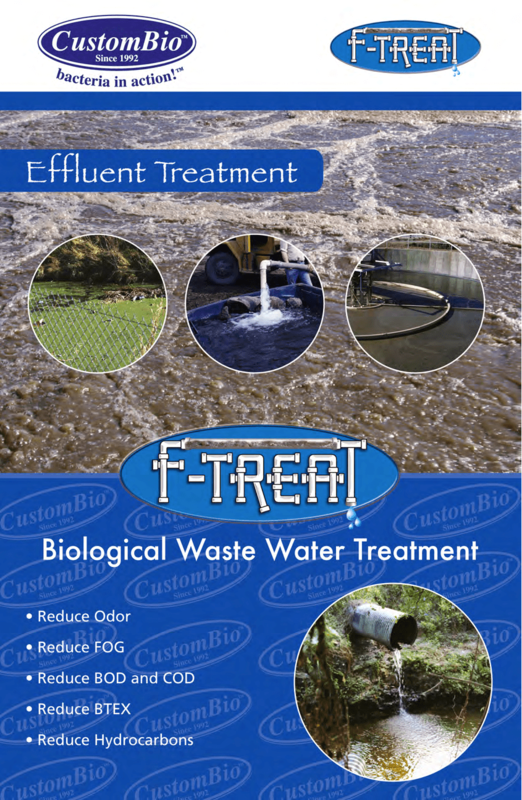 F-TREAT contains bacteria proven effective in improving wastewater treatment plant performance. The bacteria in F-TREAT will break down and metabolize organic compounds such as; fats, oils, and grease (FOG’s), proteins, starches, hydrocarbons, BTEX components, and phenols. Specifically, here is a list of typical uses of F-TREAT at municipal wastewater treatment and sewage treatment facilities. Improving efficiency in the reduction of BOD and COD. Custom Biologicals has over 20 years experience in helping municipal wastewater treatment plants operate more efficiently, and more cost effectively. Contact Custom to discuss your municipal wastewater problems.